This seems like a project I’d like to try, it sure would dress up any room and have a custom feel without the custom price . Awsome idea thanks for your easy to understand instructions!!!! Thanks for all the great photos and instruction. I made one over the weekend and it turned out perfectly. Everyone is amazed at how professional it looks! Hi Frances, I would recommend placing your slats 6-8 inches apart. If you did 6 inches apart you could get an even 10 slats, including the bottom weighted portion. Hope this is helpful! Good luck! thanks thats what a would do,the 6-8 is the only way…working with 7 and 3/4 will leave 3 1/4 inches at the bottom,small slat…. Couldn’t wait to try this! My husband actually found this for me. 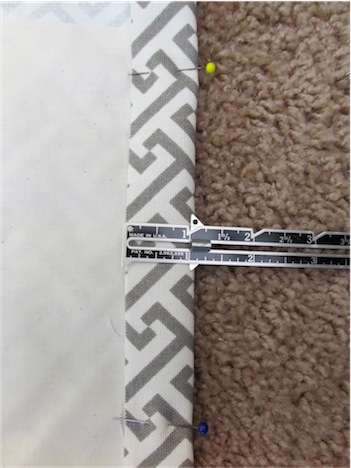 I only wish I had read step 15 because my husband screwed the brackets into the top of the frame while I worked on the fabric. I had to make a few adjustments but it looks great! Thanks for the ingenious idea and instructions! These look great. I have been looking at these types of tutorials for awhile now but I’m nervous to actually do it! How do the blinds look from outside? I would be making them for my main floor windows, I am concerned about what the back of the blinds looks like from outside of the house. I don’t supposed you know the name of the fabric that you used. It is the same pattern as my nursery and I’ve been looking for it everywhere!!! Could you add a blackout piece of fabric or a plain liner to the back to make it look nicer on the back? My windows face my patio where people will be sitting. I think blackout or a plain liner would look great! I didn’t have to worry about the backside of mine since they’re on a second floor window on the back side of our house. Good luck! 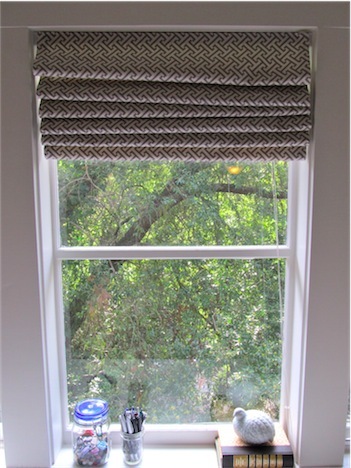 I made two black ones with white backing for my kitchen windows, Then I added a valance that can be switched out as I feel like it. They turned out really great and I am now working on the ones in the foyer. My blinds came with the house so they are all mounted very close to the top. i just stitched across the top and only glued the middle on the top bar. seems to be working well and has a nice clean look! How did you do the backing? I would like to make these but like you I would need a backing since our patio would be looking at the backside of these. Thank you for this great idea! I have paid over $100 for the blind-type supplies and still never got it to work. Maybe I could do this. Was it hard to remove the blind slats that you didn’t want? WHAT A WONDERFUL PROJEST..WHERE CAN I SEN A PHOTO OF THE ONES I DID? I’m so glad that yours turned out well! You can send a photo to me via email at simply.mrsedwards@gmail.com or find me on Facebook at Simply Mrs. Edwards. I have micro mini blinds that I would like to repurpose for this project. Do you think I could use them? They are 1/2″ slats. 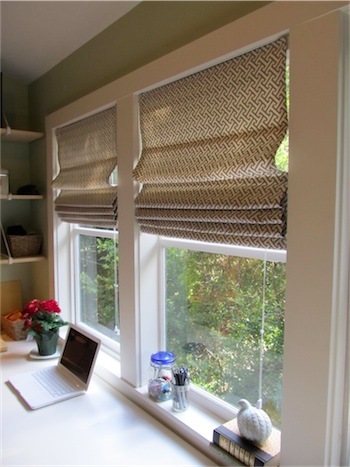 Hi Pam – I’ve never worked with micro blinds, but I think it you left a few more slats on (which would create more folds), that would give the fabric more space to “stick” to. Make sure to use good glue and I think you should be good! Let me know how it turns out! 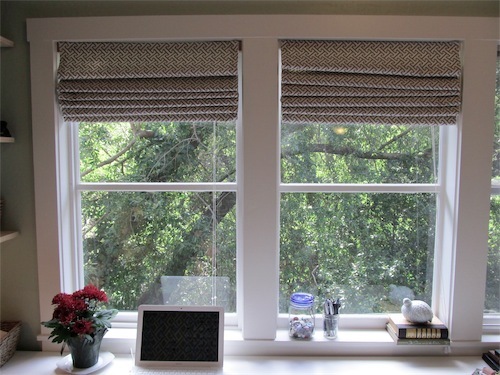 Thank you so much for such an easy to follow Roman blind editorial. I just made mine using a 20 year old dirty ugly mini blind and converted it to an elegant crisp looking Roman blind. My spare room looks “finished”. I used 100% cotton material and lined it before gluing on the slats. So easy to make. It took me all of 2 1/2 hours on a Wednesday afternoon and installed it this morning. Thank you again. Great tutorial! LOVING my new shades!! Thanks for the tutorial! I looked at many of these, but ended up copying you most closely because you had used a liner. 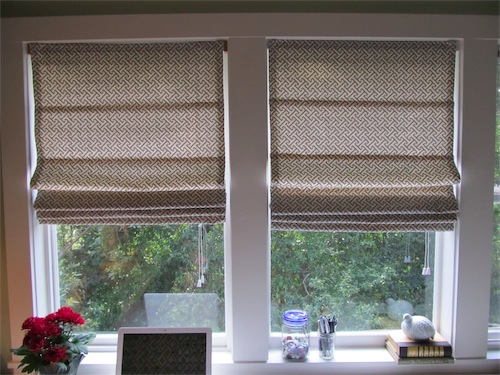 My front fabric was ivory/dark cream, and I could only find pure white cut-to-fit mini-blinds (my windows were totally naked–oh my!–before this) so I added a piece of white drapery liner. 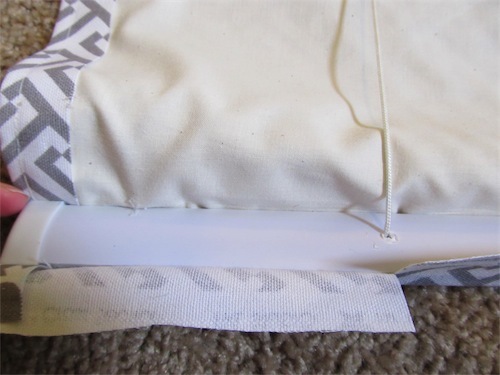 Something that I did a bit differently was that I used fusible seam tape on the sides, so I only glued the slat to the inside edge of the side seam, and after the glue had dried, I pried up a bit of the side seam, tucked the mini-blind slat inside it and re-ironed. It made the shade look very finished from the back side! 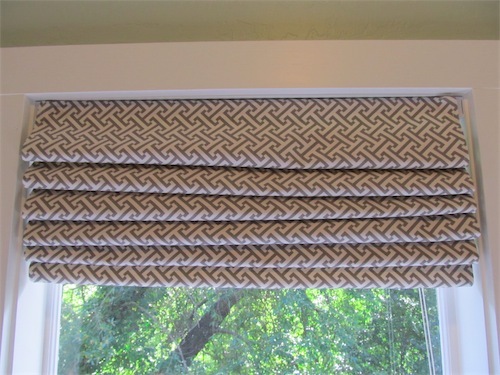 I also am thinking, after watching tutorials on making traditional Roman shades, that if the shade starts to sag, you could just hand tack a couple of stitches at each slat where the pull cord goes through–that would make it similar to a traditional shade. Thanks again! I want to make these, but I’m worried about how child safe they are. Are the cords strangulation hazards? could a child “hang” themselves accidently from these? 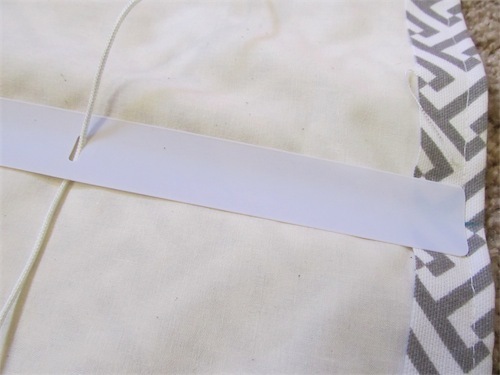 One of the other commenters mentioned putting a piece of fabric on the backside too, essentially encasing the cords and slats into a fabric “pocket.” They were wanting to do this for aesthetics, but I wonder if this would eliminate the exposed cords, perhaps making it more childsafe too. 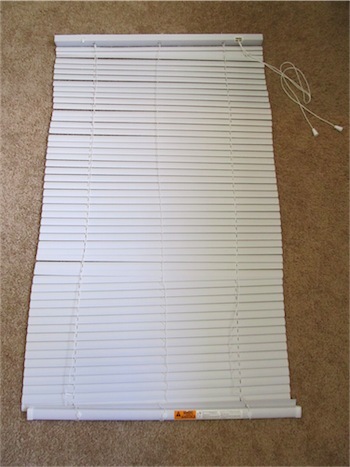 There is no more of a danger with these blinds than there is with normal mini-blinds. 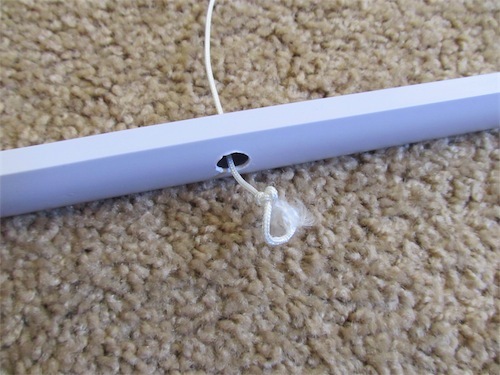 As long as you wrap the pull cord around a hook – out of the child’s reach – you should be okay. Great question! What a great idea!! 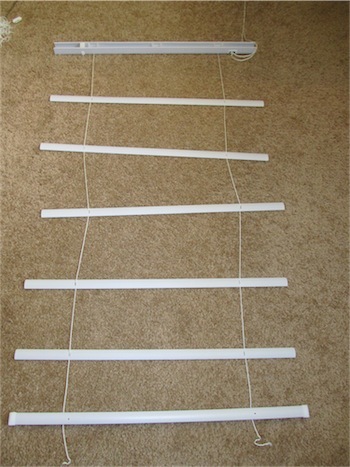 I would never in a hundred years have thought of using my old blinds for this, but now that I’ve seen your tutorial, I can’t wait to try it! Since it’s been almost two years since the original post, I’m wondering how they’ve held up? Have you had good luck with their longevity, or have they started sagging, etc? 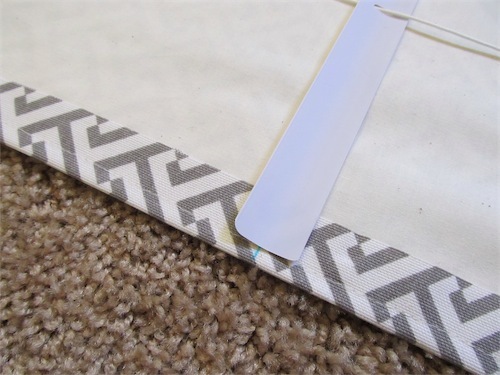 I’m really keen to make a pair for my daughter’s room, and am hoping to put some initial time into the making-process, then not have to update/touch up the blinds for quite awhile :) Love the site — thanks again for the great tutorial! I want to try for my kitchen but I’m concerned about cleaning them. 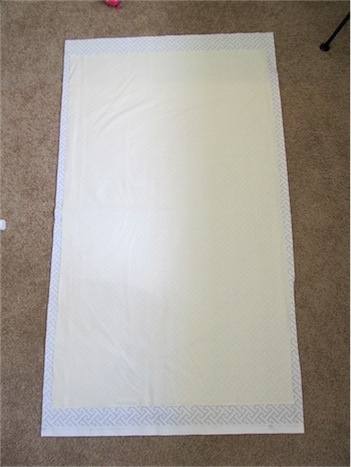 Any suggestions on how make them so the fabric can be removed and put in the washing machine? Hi Lisa – I suppose you could attach velcro to the slats (maybe with fabric glue or hot glue) and on the fabric too (I would sew it on). That would allow you to pull the fabric off and throw it in the wash. If you do end up doing it, let me know how it turns out! 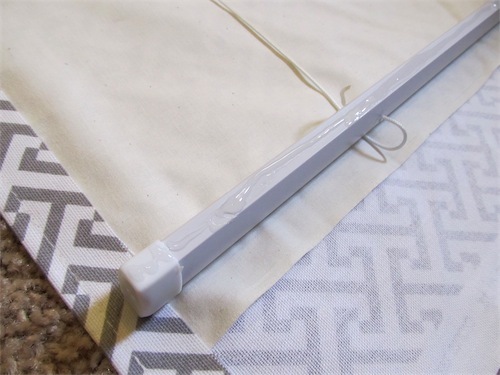 I love this DIY Roman Shade project and can’t wait to go fabric shopping. I have these aluminum blinds in my kitchen that have to go. We are going to do a whole kitchen renovation anyway, so I want everything new and different. If I can cut some costs that would be great. Your Roman shades will definitely cut some costs. I have a feeling that if this project turns out great, that I will do other windows like the two in my basement, and bathroom and maybe more. Thanks so much for your DIY project. The instructions look pretty clear and easy. I’ve noticed some sagging in the middle of shades made by others from mini blinds. Have you noticed any sagging on yours? Could the slats be strengthen by glueing two slats together? 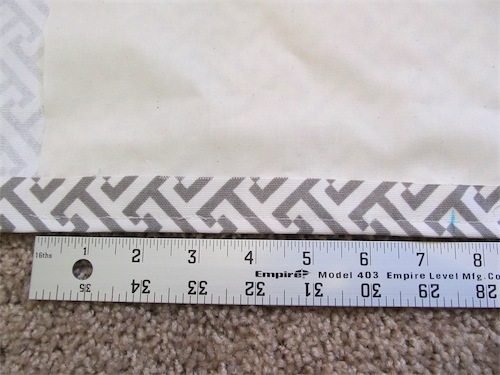 Could i stictch and glue and boning slats to the fabric? Love your tutorial! I didn’t seem to notice you mentioning how many yards of fabric you used? My blinds are 30in x 62in. Any suggestions? Thanks! I love this idea but, how do you clean them when they get dirty? I made one yesterday, and used blackout fabric for the lining. This made it too heavy for the slats, and they started to bend, which caused that they didn’t want to fold. Hi Petra, maybe your blackout fabric was too heavy for the number of slats that you left? I used a lightweight cotton, so I didn’t have that problem. Maybe next time try leaving a few more slats to see if that helps with the weight. Hi , I followed your directions on blinds ,everything came out good but when I hanged them the pulling string comes on the left side behind the blind it does not pull the blind properly ,can you help me to fix the problem please . Thanks. I see that you used fabric glue to attach the blind slats to the lining, correct? What keeps the face fabric attached to the lining?? 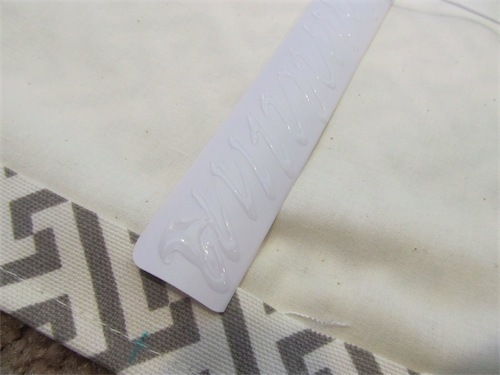 The two layers of fabric need to work as one, and with this method, I don’t see how they can…. 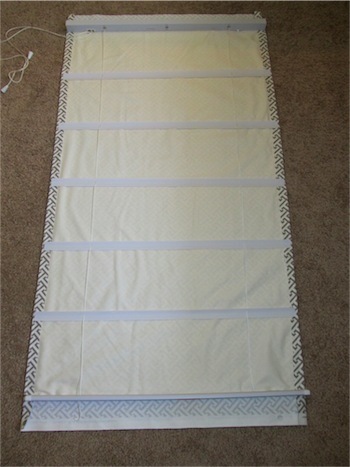 Hi Jan, the fabric is connected on the sides so as you pull up the slats, the fabric actually folds pretty well. 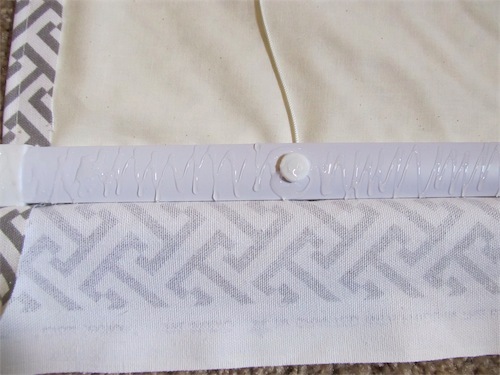 If you’d like, I suppose you could sew some seams across the panels (horizontally) to connect the layers more thoroughly. You could then glue your slats along those seams. Does that answer your question? This is a great tutorial- well done! My only concern is what the neighbours see. 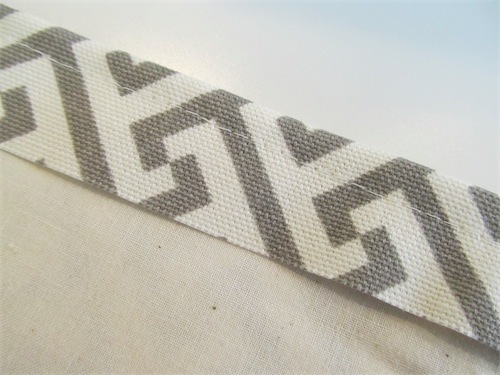 I want to make these for my three large living room Windows, but I’m not crazy about everyone seeing the blinds glued to the fabric. Maybe I could add another backing to hide the mini blind slats? 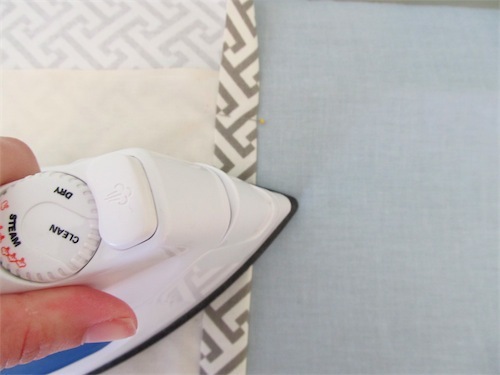 You could easily use fabric glue to add a lightweight panel on the back. I’d recommend using fabric glue; I suppose you could sew it on, but it may be difficult to maneuver on your machine. Let me know how it turns out! Good luck! Wow. Amazing..! Will give it a shot. Hello, I would like to know what kind of fabric you used. I want to do this for my boy’s room. Thanks for the step by step instructions also. This was great! 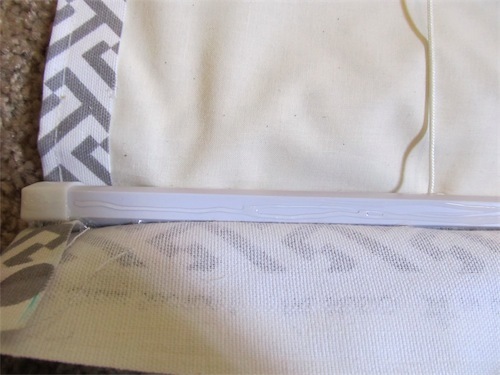 A couple of suggestions- use the plastic mini blinds and I purchased curtains from Tuesday Morning and Anna’s Linen- a lot less sowing and some already came with lining! thanks fo much for such a detailed tutorial. i’ve seen a lot of these but yours has great detail and pics! Looks very nice!! 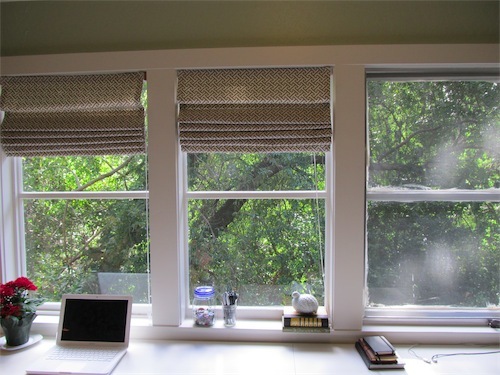 Would there be a way to hide the slats from the miniblinds by adding the liner on top of the slats, sandwiching the slats? The fabric just sort of hangs in the middle and the mini blind slates bow. But it looks good when hanging down. Bummer – it does sound like it may be too large. Perhaps next time try keeping more slats on; that may help with the sagging. what about the back of the blinds? id like to do this to large living room windows, but the other side show through to the outside/front of the house. You could easily tack a plain piece of fabric to the back to cover the slats. I believe some other readers have done this. What a great tutorial! I am going to try this for sure. How did you get the wand that turns the blinds off? I believe I just broke it off. Yes, keep the bottom bar. See step number 9 of the tutorial to figure out how to calculate how many slats + bottom bar that you need. Good luck! Can’t wait to try this! I saw ideas on Pinterest on how to hide messy bookshelves with diy curtains. So I plan on doing so for the two freestanding bookshelves in my living room with diy Roman Shades and make each fold where each shelf ends/begins! Super excited to try your tutorial! Looks so much easier than others I’ve come across, very innovative! 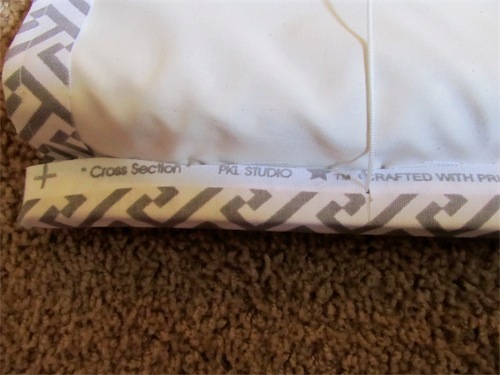 How necessary is the “lining” fabric layer? Think I could get away with not using it? 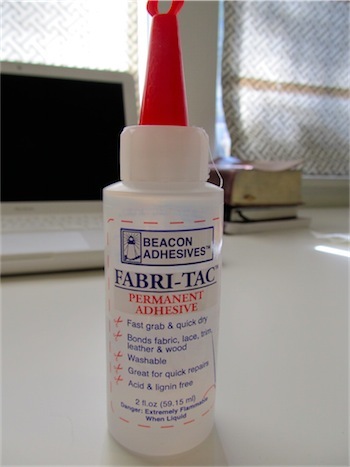 I’ve seen product reviews for the Fabri-Tac glue that say it doesn’t ooze through fabrics being glued, so wondering if I could get away with not using the lining layer since back side will never be seen… Thoughts anyone? What a great idea! In your case, I don’t think the lining fabric is necessary at all. It’s basically needed to block light coming through a window and/or make the back look nice, but since neither is needed in your case you should be fine! How did you install your shade? I made one but couldn’t figure out how to hang without altering the fabric so it could sit inside the square blind pieces. Hillary – be sure to attach your brackets to the SIDE of your window sill, leaving about an 1/8th of an inch of room at the top. That way you can slide the blind into place and push the fabric over the top of the bracket. Hope that’s helpful! Hello, I’m starting make these roman shades for our bedroom. We have one window and french doors. Do you think adding the 6″ to the length of the door windows would be enough? Thanks for such a great tutorial!! I just made this for the kitchen window above the sink, and I’m in love! 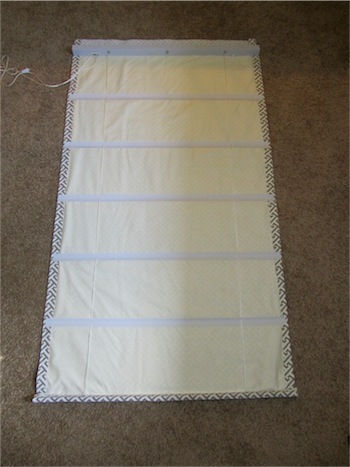 Thanks for the tutorial….I made these for my bedroom (needed to block light for the weekend naps;)) They work great! Getting ready to make a second set of 2 for another bedroom. 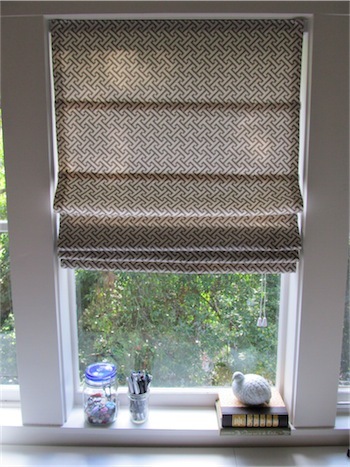 I don’t have curtains in my house….only blinds…..so these diy roman shades give color and “dressing” to my windows. Too bad I didn’t see this before I bought all new wood blinds to go throughout the house! My mum and I did a set of blinds tonight. They turned out beautiful! I found your tutorial on Pinterest and just used it to make some black-out shades for my baby’s room. They turned out perfectly! Your instructions made it so easy and I was surprised by how fast the project went. Thanks for the tutorial! I cannot get my blind to make the folds, any suggestions? Do you think you can do this with cordless blinds? I’d love to use them over the pull string. Any thoughts?? I’m going to make three!! Can’t wait!! 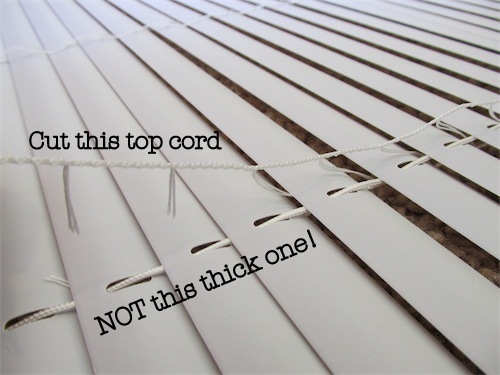 Were you successful making the shade with the cordless blinds? WOW! I’m really glad your blinds came out the way you wanted them. DIY has never been my thing. But I’m willing to try this one out because these end results are what I want out of my own set of blinds. Would you ever respond if I needed help? Thanks! Hi Bailey – so glad you’re going to try them out! Yes – please let me know if you run into any issues and need help. You can always email me at simply.mrsedwards@gmail.com. 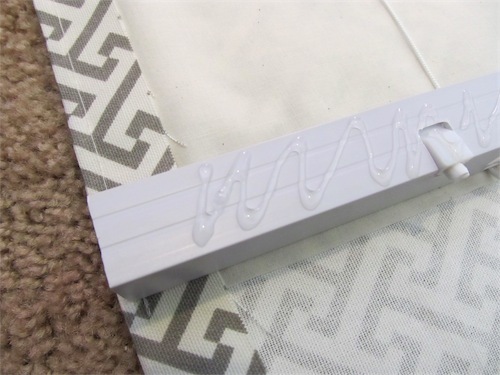 Make your own diy vertical blinds ! How do you wash them? I would love to try this just have that question? I’ve actually never washed mine (I’ve just vacuumed them when they have gotten dusty) – but I suppose you could attach velcro to the slats and the fabric so that you could remove the fabric. I’ve not tried it but it might work! 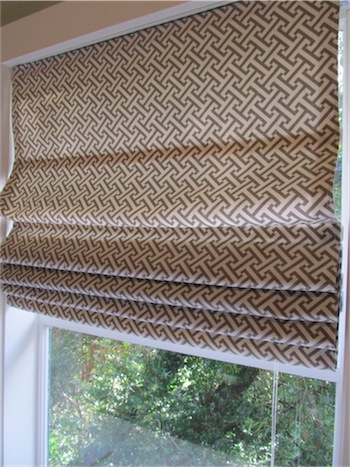 I have made roman blinds in the past the traditional way- very time consuming. This looks really great and I want to try it but I have a question- How can I be sure the glue will go through the lining and attach to the outer fabric? And does it leave a residue or mark on the outside? Did you cut out the middle ladder on your blinds? 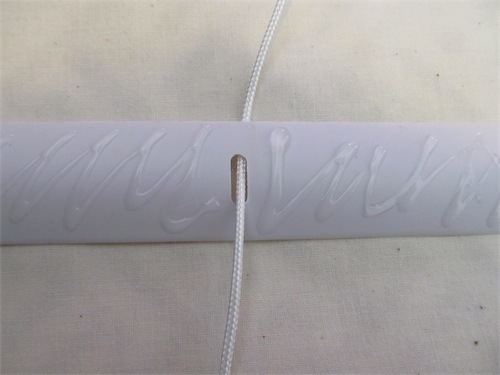 Hello Mrs Edwards ?…..I am just finishing up a Roman shade following your instructions and was wondering how have these shades of yours held up over the last few years? Thanks! 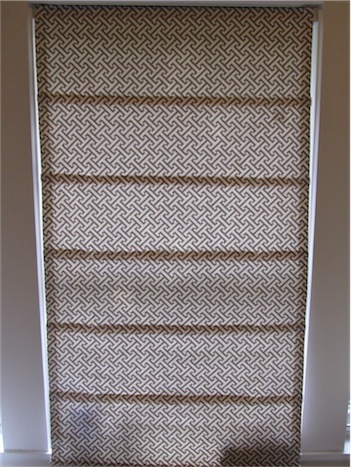 Crazy question: Could I take the slats off the blind, sew them on the shade, and then rethread them? I know I would need a heavy duty needle on my machine. The blinds I bought to work with do not have the thick cord going through the holes in the blinds. Has anyone else dealt with this issue before? The blinds I’m working with are 2 1/2″ faux wood ones. Thanks for any advice! 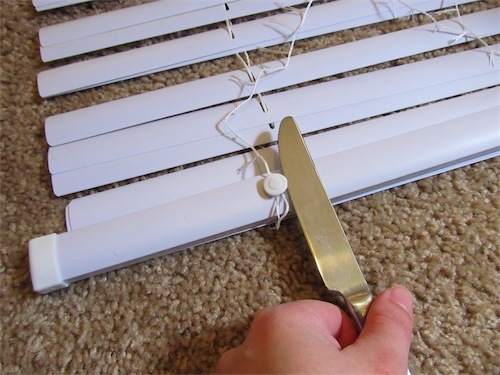 I was just reading your post on how to make roman blinds from mini blinds. 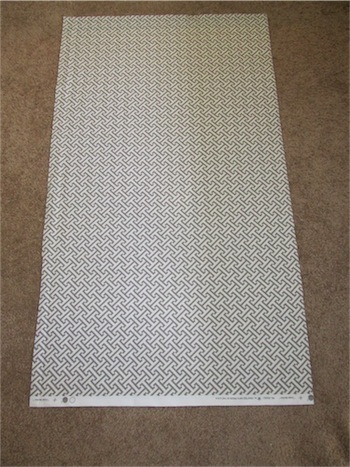 I went to Wal-Mart bought my blinds and a curtain panel that I am hoping to use as my fabric. I got home and realized that I bought Mainstay (Wal-Mart brand name for stuff here in Canada) 1” Cordless Mini Blind. It was the only one on the shelf. I did not realize it was cordless until I got home. I like that idea since I do have wee ones running around here. Is there anything I need to do to revise or alter your instructions to make this work. I wanted to ask before I start cutting. Thanks so much. LOVE this idea. I started to get new blinds until I saw how simple you put this together!